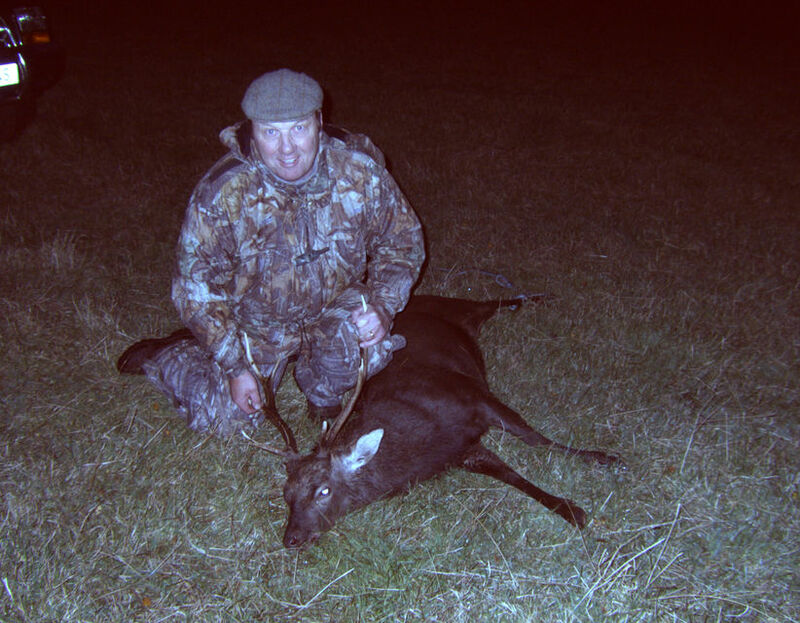 I thought I would share this with you, it is a Sika stag that I took Monday evening. To set the scene we went out first pre dawn yesterday and all we saw was 10 hinds, which are not in season yet, so we left it until the evening. We got on site about 6 O'Clock, parked up and because I am not too good on my legs I drove to within about 300 yards of where we wanted to be. By the time we had struggled into position over this vast distance, it was 6.30. We immediately saw a hind that was running around and seemed to be playing, it then did the Sika thing and just vanished from sight. By now stags were whistleing, the first one was from the left accross the river abour 5-600 yards away, then one away to our right had a go, my turn. So I then broke into song with the caller, it is a sceerey elk call but doubles up as a Sika call, I gave what I considered to be a typical Sika three whistle sequence, mind you the first one sounded like a goose after a bad curry. I then spotted a movement, 200 yards away to our left and coming in like a train, he was not shy the curry goose had obviously upset him. He got to within 100 yards and stopped, he was looking hard in our direction. Now, because of the way we were sitting and that bugger coming from where he was not supposed to be, I was going to have to shoot left handed. Now I did not panic too much as I am one of those peculiar folk who can and quite often do shoot left handed. I am not ambidextrous, in fact I do everything right handed with the exception of writing and using a knife and fork, so I am not completely useless left handed. Now this is where the luck comes in, first the good luck he turned to his right, giving a clear shot to the boiler room, now the bad luck the left hand shot would have to be off hand, oooer! Now more good luck, I swallowed hard took a deep breath, shouldered the rifle, breathed out, held my breath and took the shot. I heard the shot hit home and the stag took off like greased lightening, he was getting shorter and shorter, as if he was going down stairs, as he made progress then he vanished in the long grass. My pal, who was behind me, stood up to mark the spot, he said I have my bearings, I replied don't move. Another stag had appeared from the left, he was about 250 yards away going very warily indeed, he was not sure what he was seeing, he didn't like it anyway and ran off. We sat tight for 15 minutes and then went to look for the shot stag. There he was dropped just where we lost sight of him, about 15 yards from where he was shot. It was now 7 O' Clock. He certainly was in good condition, never had such a healthy looking stag. The rifle was a CZ550 American in 6.5X55 SE with a T8 moderator, the load was 129 gr Hornady Interlock, lapua brass, CCI LR primer and 45 grains of H4350. Now for the Sika revenge, we got him back to my garage and were getting ready to put him in the chiller, discussing the plan of attack for this evening and getting the other buck, I should add these buggers are in fact a nuisance and no matter how hard I hit them, there never seems to be a shortage of them. Anyway about now I started a reverse totter on my dodgy legs and did not stop until I landed flat on my back on the concrete garage floor. I had every bit of wind knocked out of me, I rolled over onto my side and there was the stags head, I swear the bugger was grinning at me. I can now hardly move, my wife had to dry me off this morning after my shower and then help me get dressed. Bloody stalking! I won't be fit to go again until the weekend, but the stags are in a silly mood and seem to like curry and geese. Nice stag, JayB. In Scotland, is it a bad thing to have your wife towel you off?? Just curious as my Family used to own Holy Island. Congrats JayB. Very Nice !! Nicely done! And great story, too. Congratulations mate, a damn fine looking fiadh-Seapanach cabrach-crocach.